It's a 2/3, like Abzan Falconer. Unlike Abzan Falconer, it always has to compete with Levitation in Modern and eternal formats, and does so poorly. 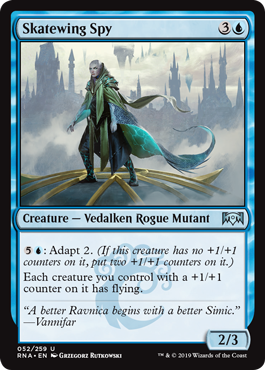 But unlike the Falconer, this fits into simic counters-matter decks. Mutant, Zombie, Spirit, and sometimes Vampire are also seen as a sort of state. But how that's used depends, and there's no hard grammar about whether they come before race, between race and class, or after class.